If you’re looking for the best expert college football predictions for Week 9 then you’re at the right place. This is a compilation of the best of the best of our daily free sports picks, posted by professional handicappers. Without further ado, here are the best bets for Week 9 of college football action which just happens to be a 3-pack of dogs! Purdue has been more competitive under interim coach Gerad Parker and catches Penn State in a monster letdown spot. The Nittany Lions are on the road after just upsetting previously undefeated Ohio State at home last Saturday. It’s a double whammy for Penn State, which is 3-12 ATS after covering a game and 3-14-2 ATS in its last 19 away contests. Penn State hasn’t traveled in four weeks. This is only its third road game of the season. The Nittany Lions are 0-2 on the road giving up an average of 45 1/2 points to Pittsburgh and Michigan. Penn State is 0-7-1 ATS the past eight times it has been a road favorite and has lost straight-up seven straight times away from home under James Franklin. Parker’s first game as interim head coach was last week. Purdue was a 24-point road ‘dog to then ninth-ranked and now seventh-ranked Nebraska. The Boilermakers played hard, led 14-10 at halftime and gave the Cornhuskers a scare before losing, 27-14. The Boilermakers have covered seven of the last eight times following a loss. Purdue has some decent skill position talent that can take advantage of Penn State giving up an average of 4.7 yards per rush and 203 yards rushing a game. The Boilermakers have been weak defensively, but received a boost from 345-pound tackle Lorenzo Neal, who recorded three tackles behind the line of scrimmage versus the Cornhuskers. Parker should have Purdue playing hard again this week with the team still alive for a bowl berth. Temple is coming off an impressive victory last week against USF but I think that is more of an anomaly. This team still have major issues and they do not warrant being this big of a favorite against anybody in the conference. 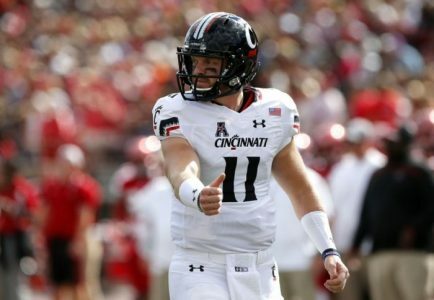 Cincinnati is a classic underachieving team but they still have a ton of talent and they are coming off a victory last week against East Carolina. The Bearcats have been covering the spread in 70% of their games played during the month of October (10 game sample). I fully expect them to take this game down to the wire and we will collect with whoever comes out on top. My clients and I cashed in betting against Washington State as road chalk last week in a ‘closer than expected’ non-covering win at Arizona State. And there’s absolutely no reason to think that the Cougs are being priced appropriately as double digit road favorites as they travel to Corvallis on Saturday Night. This is the wrong price range for Washington State in a very hostile road environment. It’s also the wrong pointspread range for an Oregon State team that has been getting killed on the highway, but consistently playing competitive football at Reser Stadium. There’s been one very consistent facet of Mike Leach coached teams, dating back to his tenure at Texas Tech – they have letdowns, not a coach who’s prone to guiding his team to extended winning streaks. In his fifth season at Washington State, the Cougars current five game winning streak is the longest of the Leach era. Only once during his extended tenure at Texas Tech did the Red Raiders win more than four in a row. And when it comes to winning on the road by big margins, the Cougs again have a very limited track record. They won five games away from home last year, none by more than a touchdown. They didn’t win a road game by more than a touchdown the previous year either. They lost at Boise in one road game this year, and barely hung on to beat Arizona State last week, notching only one win by margin on the highway (against collapsing, offensively challenged Stanford in the game where Christian McCaffrey got hurt and the Cardinal fell apart without him. Oregon State has won three of the last five meetings against Wassou in SU fashion, and a fourth loss – Washington State’s last visit to Reser – was a competitive, seven point defeat. This is not unusual for the Beavers. In previous ‘step-up’ games at home this year, Gary Anderson’s squad covered the spread against Boise, pulled the outright upset over Cal and hung within five points of Utah in another spread covering defeat. And Oregon State has the appropriate game plan to keep the ball out of Cougs QB Luke Falk’s hands. The Beavers do one thing well – they run the football, gaining 177 yards on 5.8 per carry against Washington’s elite defense last week. They ran for 197 against Utah the previous week and 474 against Cal in their last win, at home, right here in Corvallis earlier this month. Expect a competitive contest, not a blowout. Take the Beavers.